Buyers are driven to successfully find solutions to the Critical Business Issues (CBI) that confront them (see our previous post for a more detailed review of CBI’s). The buyer’s concern to successfully find a solution to a critical business issue starts out at a very low level in stage 1. Although the buyer is confronted with a critical business issue and would like to have a solution, s/he has put it in the background of their mind, i.e., they are not actively seeking a solution. They may have done this because the CBI represents a lower level of concern (compared to others), or they may not feel there is a solution, or they may have found a solution but concluded that it cost too much or was too much risk, or they may have even purchased a solution but failed when they tried to implement it. Therefore, the level of concern to seek a solution to a CBI may start out at a very low level. But for some reason (perhaps the buyer’s boss says it is important and needs to be solved, a new solution comes to market, the buyer resolves one or more issues and the CBI that had been in the background moves to the foreground, etc.) the level of concern increases significantly. It is surprising how many marketing organizations fail to realize and take advantage of this. All too frequently their messages reflect what they think are really cool things about their products’ features and functions, which buyers are not yet interested in. They miss significant opportunity by not orienting their efforts towards showing buyers how to solve the high probability CBI’s confronting them. This is also why prospecting is a particularly loathsome task for most sales people: Traditional prospecting is fraught with failure! When sales people do prospect, they very commonly “lead with product”. This means that they talk about features and functions of their product that the buyer is just not interested in hearing about. It is the equivalent of walking into a minefield. If, after the product pitch, the buyer says, “No thanks, I don’t want to meet nor do I want to hear more about your product”, the seller is left with little recourse. Should they continue to attempt to push their product, it is the equivalent of attempting to push a rock uphill by trying to convince a buyer who said no that they really do want to hear more about the product. That fails, sometimes miserably, and eventually results in the seller doing everything except prospecting. But what if the buyer says, “Why yes, your timing is perfect! In fact, if I like what I hear you can respond to the RFP that we have coming out!” The seller thinks they have a great opportunity. But isn’t it likely that the buyer is releasing the RFP because their organization requires them to look at multiple vendors? In fact, isn’t it likely that they are already deep into stage 3 with the competitor who got in first and already defined the solution to the CBI with the buyer? So what should marketing and sales organizations do? They should first realize that most buyers – to the tune of about 90% – have not yet entered into a buy cycle where they are actively looking for a solution because the issue is in fact a background CBI! Whether developing traditional literature, updating the buyer-focused components of their websites, prospecting, or developing outbound messaging for social networking, instead of leading with product, they should lead with how they help solve high probability CBI’s. The buyer’s concern for the solution rises to a peak in early stage 2 and remains high throughout that stage. Something has caused the CBI to emerge as a foreground issue. As we said earlier, perhaps senior management in the buyer’s organization has said that the issue needs to be resolved. Perhaps a sales person conducted an effective prospecting call that resulted in the buyer having hope that there really is an effective way to solve the problem. In Stage 2 the buyer wishes to move from being in a situation where they have a foreground CBI to where they envision a solution to their CBI. Yet this is another area where sellers misalign in a major way. What do most sellers do when they do secure an appointment or are invited to meet with buyers, and the buyers are in Stage 2? Death by PowerPoint! Continuing with their bad habit of leading with product, sellers deliver their latest and greatest presentation, which is yet another seller-centered attempt to convince the buyer they should look at their products. All they do is convince the buyers that they are pushing product and are incapable of helping them solve the problem that is on their mind. This is the key Window of Opportunity for a seller because the buyer has a Foreground CBI and now wants to discover a solution to it! Aligning with the job titles of the audience, when the seller introduces themselves it should be with a “we help solve problems” theme designed to get the buyers to conclude that this seller can in fact help them. It sets the stage for buyers to open up about their CBI or CBI’s, and the discovery process. The buyer’s concern for the solution remains high in Stage 3 then drops off rapidly. Once the buyer has envisioned a solution to their foreground CBI, they want to see whether there is someone who can provide the solution! They seek proof; proof that someone in the marketplace can in fact provide the capabilities they need to solve their problem. 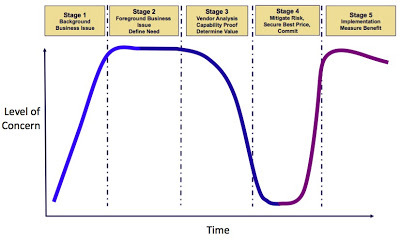 Stage 3 of they buy cycle is also where the seller’s product / service / solution emerges as being important…and not until Stage 3! And buyers do not need to see 5,000 features. Their key interest is in seeing whether the capabilities, which the seller should have defined with the buyer in Stage 2, can be provided. It is therefore critical that the seller understand specifically what those capabilities are. And, if possible, earlier in Stage 2 the seller should have done their best to define those capabilities in a way that differentiates them. From the buyer’s perspective, once one or more providers have proven that they can fulfill the need the level of concern for the solution drops significantly because they are convinced that it can be fulfilled. As we will see, other concerns now emerge in Stages 3 and 4. The buyer’s concern for the solution re-emerges as a concern during stage 5 implementation. Once a contract is signed and the buyer moves to Stage 5, the level of concern for the solution reemerges as a concern, but this is a fulfillment issue. Through the capabilities we are receiving, are we on track to achieve the expected metric-based results that will eliminate the CBI? To align with the buyer, the efforts of the seller should now focus on working with the buyer to make sure that the buyer, who is now a client, achieves the results anticipated. Stay tuned for our final post on “How Buyers Buy”, when we look at two key concerns, Value and Risk.